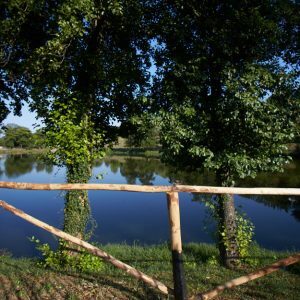 The Lago Verde is a private fishing club in Serravalle Pistoiese a few km’s from Florence, Pistoia, Lucca, Montecatini Terme set in the perimeters of Hotel Lago Verde, from which it takes it’s name. It is a lake in which it’s possible to do Carp Fishing by following a regulation for the preservation of the local fauna and flora and subordinated to the registration through a AICS card. The Lago Verde is unaltered and preserved in it’s natural state, there are many fish species of considerable sizes, which populate the lake since it’s origins, like CARPS, AMUR, BLACK BASS etc.These inhabitants have never been subject to fishing pressures and are not yet aware of the fishing method with bait.therefore you will be in an uncontaminated and unpolluted area, surrounded by the Tuscan green hills and immersed in total relax. Our coworker will welcome and accompany you in the rod pod and will explain all the details for a good fish. We ensure a lot of fun to our fisherman! You will be supported by the hotel services where you will have access to the bar/cafe, restaurant and toilets throughout the whole day. As partners of the Aics, you and your companions will have a special rate for your stay, and access to the outdoor swimming pool during the summer will also be included.